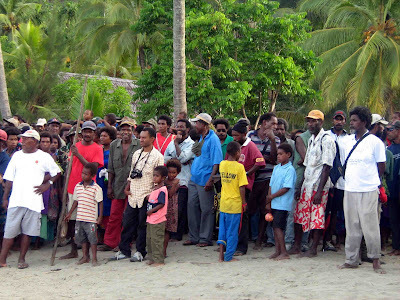 It was one of those typically-beautiful Huon Gulf days on Friday, October 12, 2007, when we sailed from Lae to Malalo on Lutheran Shipping’s MV Rita for the 100th anniversary of the establishment of the historic Malalo Lutheran Mission Station. It was a sunny day, not a cloud was in the sky, as if they did not want to spoil the celebrations. Hundreds of people from all over Salamaua, Morobe Province, converged on Malalo that Friday for the centenary celebrations. Work started on this icon - overlooking idyllic and historic Salamaua – exactly 100 years ago on October 12, 1907. 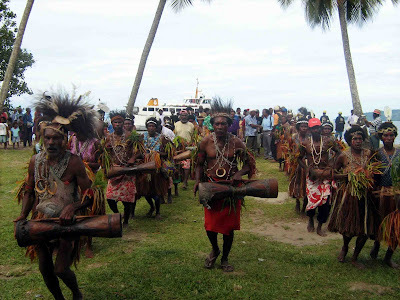 Surrounding villagers and guests from Lae, other parts of Morobe, and Papua New Guinea, converged on Malalo for the 100th anniversary celebrations. 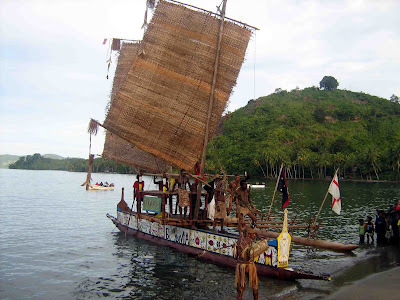 The people of my mother’s Laukanu village rekindled memories of yore when they brought a kasali (ocean going canoe) to Malalo in a re-enactment of the arrival of the first Lutheran missionaries. The people of Laukanu were among the greatest mariners of the Huon Gulf, making long ocean trips throughout the Huon Gulf to exchange goods, long before the arrival of the white man. When the first Lutheran missionaries arrived in Finschhafen in the late 1880s, the Laukanu made the long sea voyage to Finschhafen, and helped to bring the Miti (Word of God) to the villages south of Lae. 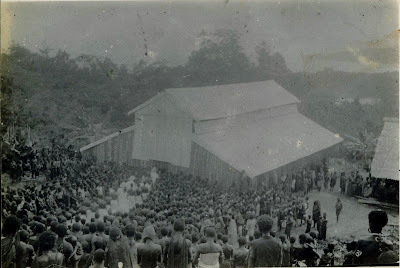 The launch of the kasali celebrated not only the great seamanship of the Laukanu, but more importantly, coincided with the 100th anniversary of the establishment of the Malolo Mission Station - overlooking idyllic and historic Salamaua – on October 12, 1907. The people of Salamaua and surrounding villages, who make up the Malalo Circuit, converge on Malalo last week for this momentous occasion. It was a time for all to celebrate the important role the church had played in their lives, as well as remember the many expatriate missionaries and local evangelists, who worked through the dark days of World War 1 and World War 11 to bring the Miti (Word of God) to the people. These legendary missionaries include Reverend Karl Mailainder and Rev Herman Boettger (who started actual work on the Malalo station), Rev Hans Raun, Rev Friedrich Bayer, Rev Mathias Lechner, and Rev Karl Holzknecht. Rev Raun suffered the humiliation of being interned by Australian authorities during WW1 while Rev Holzknecht (whose family has contributed much to the development of PNG) suffered the same fate during WW11 – their only crime being Germans. Rev Bayer was taking a well-deserved leave in his homeland of Germany when he lost his life on July 24, 1932. The heart-warming and touching story of Rev Bayer and his wife, Sibylle Sophie Bayer, is told in Sophie’s autobiography ‘He led me to a far off place’. Rev Holzknecht replaced Rev Lechner in 1939 and was there when World War 11 broke out and wiped out Malalo and its famous neighbour of Salamaua. Missionary’s wife Helene Holzknecht accompanied her husband on all but the trips along the Black Cat Trail into the Wau and Bulolo valleys, ministering to village women and helping the sick she found in these areas. The outbreak of war in Europe in 1939 brought this idyll to an end. Karl Holzknecht – being a German - was taken prisoner as an enemy alien by Australian authorities, leaving a pregnant and heartbroken Helene at Malalo. Her eldest child and only daughter, Irene, was born at Sattelberg, on February 1, 1940, after Karl’s removal to Australia. 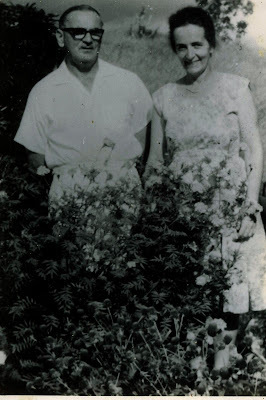 Helene and Irene were returned to Malalo, but were eventually evacuated after Japanese bombers attacked Lae and Salamaua. Helene often talked of seeing those planes skimming the hills on their way to Salamaua, and the horror of the bombing of Salamaua. Soon after their evacuation by DC3 to Port Moresby, Japanese aircraft also bombed the Malalo Station, destroying all the family’s possessions. Reverend Karl Mailainder and Rev Herman Boettger started work on the Malalo Mission Station exactly 100 years ago last on October 12, 1907. They had already checked out other places from Busamang to Kelanuc before settling at Asini at a place called Poadulu. At Poadulu, work started on Malalo. The local people were very happy and gave a large piece of land to the Lutheran Church. The Laukanu people had two kasali so they sailed all the way to Finschhafen and brought missionaries’ cargo back to Malalo. When Rev Mailainder was clearing land at Malalo, he had a surveyor, Mr Mayar, who worked alongside him. Work had already started when Rev Boettger arrived and the station was established. At that time, a church was made of sago leaves. This was after the congregation membership increased to 500. Work started on Malalo Mission Station on October 12, 1907, and the opening was on December 20, 1907. In 1908, the work of confirmation started and work started on a new church building with proper roofing iron. One missionary gave 1000 German Marks, while Munchen in Germany gave a big bell and a bowl for baptism. Work started on the new church building and on January 30th, 1910, it was opened with Holy Baptism. Malalo 100th anniversary organiser Elisah Ahimpum was pleased with the hundreds of people who turned up for the occasion, which also featured a cultural show. Plaques with the names of all missionaries and evangelists who worked at Malalo were unveiled on the day. Invited guests to the 100th anniversary celebrations include Evangelical Lutheran Church of PNG leader Reverend Dr Bishop Wesley Kigasung, Morobe Governor Luther Wenge, Lae MP and prominent Lutheran Bart Philemon, Huon Gulf MP and Health Minister Sasa Zibe, as well as Bulolo MP Sam Basil as the Miti filtered into his area from Malalo. Unfortunately, not all were able to attend, with only Assistant ELPNG Bishop Zao Rapa representing the church and Mr Philemon and Tewai-Siassi MP Vincent Michaels representing the government. However, that did not spoil the occasion, with hundreds turning up to witness celebrations marking the centenary. I spent three days atop Malalo Station in 1970. We came over from Ampo Lutheran Builders to replace the rain water tank and do some other repairs in the missionary house. I remember toting my tools up that hill from the wharf, it seemed like we would never get to the top. I'm having a hard time recalling the Missionary's name they were from Germany. I have some very scenic slides from that trip. Thanks for the memories Malum. Tom R.